Hello friends! And thanks for waiting for today’s video, I know lots of you were anxious to see it when I showed you the card on Tuesday! I’m often asked for color combos for very specific items – and pumpkins are one of them. Quite possibly because, if you’ve noticed, there’s no “Orange” in the Copic color families in the color wheel. Why is that? Possibly because “O” would be confused with zeroes, I’m guessing. So we need to use YRs, Rs, and sometimes Es to make a good orange combination. The pumpkins in the new Got Candy set are a perfect opportunity to practice oranges! Watch the video below or click HERE to see it in HD on YouTube. I think my favorite 2 parts of this card are 1) the layered pumpkins, with the front layer popped up on The Precious; and 2) the darling little ghosties from the Got Candy set! They’re so simple – and with the Glossy Accents they look so shiny in the moonlight! Love this card! The moon, sky technique, pumpkins, ghosts, bat, the colors…everything! And not too spooky. When you mentioned more ghostlike I thought about using vellum. 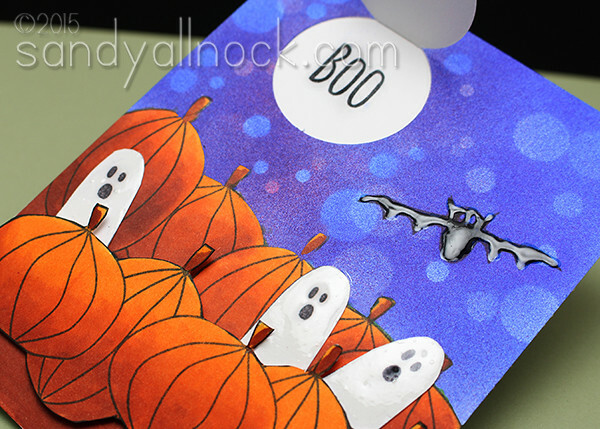 Got to think of people I can send Halloween cards to, this looks like so much fun! Hi Sandy. Love the card and the “bokeh” look is very cool. I have the EH Craft Assistant and find that the magnets are always getting blown around when I use my Copic Airbrush. I have no scientific explanation to share about why…. Beautiful card. Love that background. Thanks so much for sharing, and taking the time to make a video. Sandy, this is super cute! I could sit and watch you color and create all day! Thanks for sharing about coloring pumpkins as fall is right around the corner and I’m ready to start playing with pumpkins and gourds in my craft room. ;0) I’m a fairly new subscriber to your blog and youtube channel. The airbrushed background is so cool, a great night-time sky. I love watching your videos–you always come up with something different. Love, love, love the background/sky on this one! Loved the pumpkin coloring..what YR/R numbers did you use with the E ones? You listed the E but nothing on the others…. Lovely card. Glad to hear it isn’t just me with glossy accents and a precision tip bottle. Went through 2 episodes of the bottle being glued shut and totally destroying the nib before I gave up on the idea. I was looking forward to this video. The colors that you used are beautiful. Those pumpkins look great. Thanks for sharing. I love the sky on this card. I’m warming up to the idea of an airbrush, so I think I need to go back and review your great video where you explain all the air brush options. As always, thank you so much. This card makes me happy! Thank you for sharing. I love the colors you used for the sky and layering circles for stars?!? Simple and genius. I’m off to create! Thanks for the inspiration!